I had come to visit Bishkek Feminists “Are there really feminists in Kirghizia?” my mom had wondered before I left. On the way from the airport to Bishkek the collective’s leader, Selbi, corrected my speech several times. 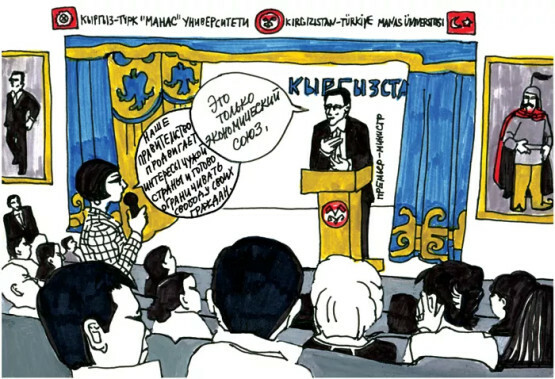 “You don’t live in Kirghizia, but in the Soviet Union, one country for everyone,” Russian teachers would explain. The majority of people in the capital of Kyrgyzstan still speak Russian. While I was in Bishkek, I heard from several Kyrgyz that Russians had symbolic capital, because they were seen as more cultured and educated. The local Russians I met said they were not the titular nation, and a glass ceiling inevitably awaited them in the civil service, for example. But they had not encountered serious harassment in daily life. I was invited to draw at the Mekendeshter Forum (“Compatriots” Forum), organized by the ex-President of Kyrgyzstan Roza Otunbayeva. The forum dealt with the issue of emigration from the country. It was held in the spacious, beautifully designed Kyrgyz-Turkish Manas University, which the Turks opened in Bishkek in 1997. 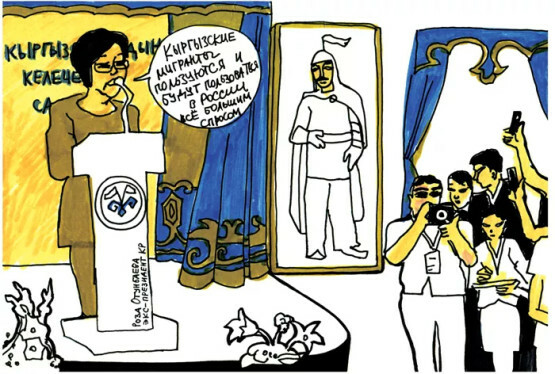 On one side of the stage hung a large portrait of Ataturk; on the other side, an image of Manas, the Kyrgyz epic hero. The forum program included a separate discussion on cooperation between the “fraternal countries” of Kyrgyzstan and Turkey. Many Kyrgyz have in recent years preferred to go to work in Turkey. Several speakers emphasized that in Turkey, compared to Russia, there was much more respect for the Kyrgyz diaspora. The Islamization of Kyrgyzstan has accompanied Turkey’s growing influence. Almost half the speakers at the forum spoke in Russian. There wasn’t a separate panel on cooperation with Russia, but the subject constantly came up, first of all, in connection with Kyrgyzstan’s possible accession to the Eurasian Customs Union. Many speakers criticized the decision. Will accession to the Customs Union impact the country’s domestic policies? 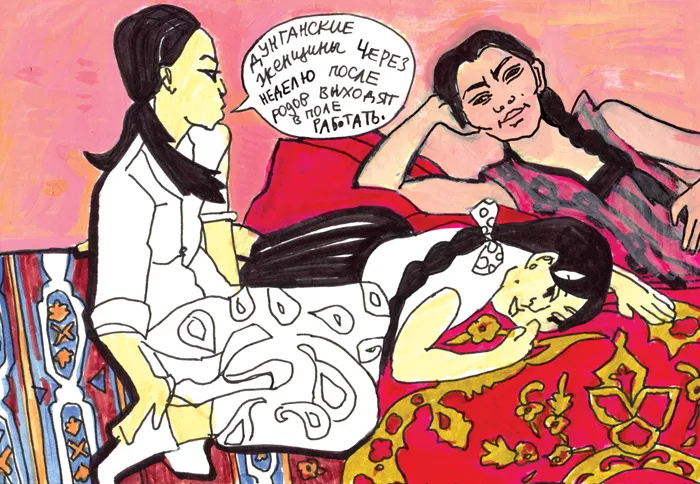 Members of the Kyrgyz parliament are already pushing through bad imitations of Russian laws, for example, a law on “foreign agents,” almost identical to the Russian law, or introduction of criminal liability for disseminating information about LGBT. Moreover, the law would cover not only “propaganda among minors,” as in the Russia “18 and over” law. 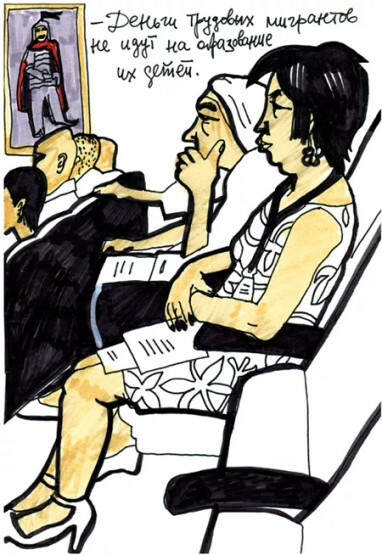 During my stay in Bishkek, there was a scandal at a contemporary art show. In his Spider-Man series, the artist Chingiz had depicted a spider in Kyrgyz national headdress. He was immediately summoned to the GKNB (the State Committee on National Security, the local version of the FSB) and bombarded with threats on the Internet. Joining the Customs Union will make it easier to travel to Russia to work and increase emigration many times over. However, speakers at the forum said that Kyrgyzstan already suffered from a lack of specialists and, in some areas, just plain laborers. Most often, the money earned by migrant workers is not spent on their own education, healthcare, buying real estate or starting a small business. Money earned over several years can be spent in a single month on a toi. A toi is a celebration with plenty of refreshments. Its main difference from an ordinary holiday feast is that there must be so much food that the guests will not be able to eat it all and will take food home with them. When a circumcision is celebrated, guests come for a month. To do a toi at a wedding, a loan is taken out which is then paid back for years on end. The closing of the forum was held at the Supara Ethno Complex in the outskirts of Bishkek. The refreshments and alcohol never once ran low. The party ended around midnight. Guests took the leftover food home in specialtoi bags. These are Girl Activists of Kyrgyzstan. Members of the group are between thirteen and seventeen years old. 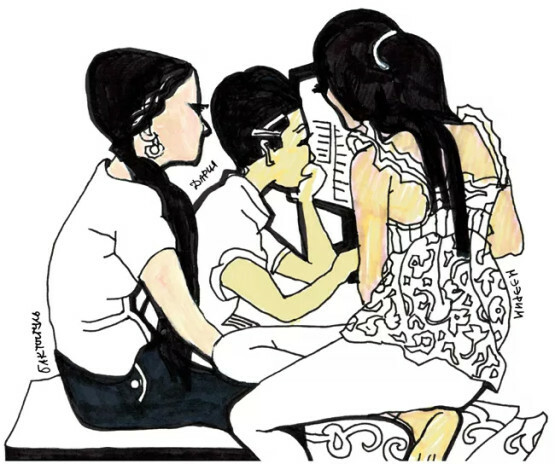 They are preparing to apply for a grant to the FRIDA Young Feminist Fund. If they get the grant, they will hold amanaschi contest for girls. Manaschis are male reciters of the Epic of Manas. However, female reciters have recently emerged. 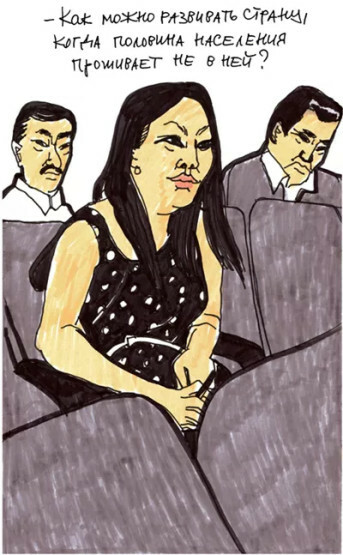 Baktygul, a member of the Girl Activists, is a manaschi. According to her, boys are specially trained, and their teachers serve as judges on reciting contest juries. Girls study on their own, and they have virtually no chance of winning at general competitions. I asked the girls about ala kachuu, bride kidnapping. Two of them said their mothers had been kidnapped. “It was a schooltime romance. My mom wanted to study, but she had to get married,” one of them said. “Aren’t you afraid of being kidnapped?” I asked. The punishment was toughened in 2013. Previously, kidnappers of underage “brides” had faced three to five years in prison, but only a fine if the girl had turned seventeen. Two years of advocacy by the Women’s Support Center and Open Line, as well as the activism of women’s groups around the country, had led to the law’s amendment. Bishkek Feminist Collective SQ held one of the biggest protest actions in the campaign in downtown Bishkek. They planted 19,300 little flags. 9,800 flags stood for the number of women abducted in a single year. 2,000 white flags stood for the number of women raped during abduction, while 7,500 purple flags stood for the number of women who had reported domestic violence. 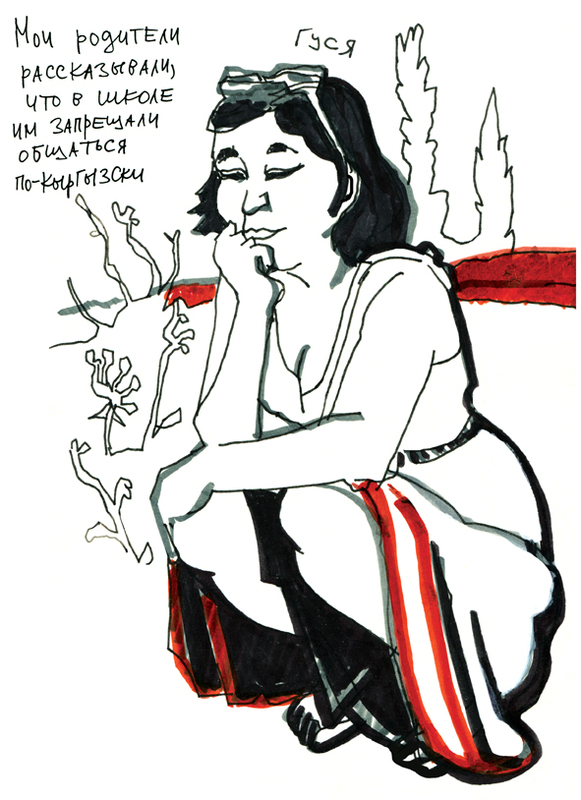 This is Farida, a Dungan and a member of Bishkek Feminist Collective SQ. I visited her home during the Muslim festival of Eid, which takes place after Ramadan. Families stop taking girls along for holiday visits, because they begin serving at the celebrations by cooking and cleaning up after the numerous guests. Dungan families are very large: several generations live together, and there is rigid hierarchy among members. The lives of girls and women are subordinated to the household. As a child, Farida was used to getting up at six in the morning to work in the house. She was not allowed to play with other children. “The house was my only space,” she said. Farida had to fight for the right to go to school. When she met the feminists and took up activism herself, pressure from family members was so strong she had to run away from home. Farida had been one of the main organizers of the flags rally. After a year of living in the feminist community, Farida returned home. Influenced by her daughter, Farida’s mother, Sofia, had become interested in women’s rights and was able to change how things were done in their home. 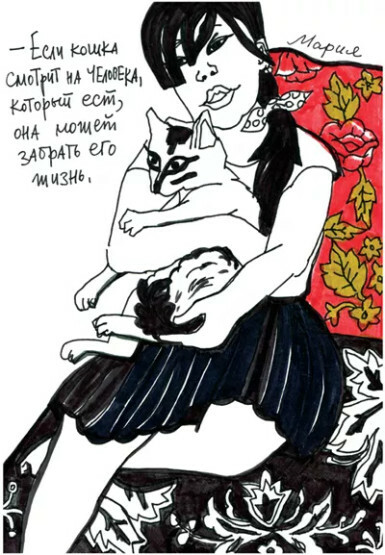 Young Kyrgyz women made the following comments about the drawing above. Hard female and child labor still persists in Kyrgyz villages. Officially, there are no LGBT in Kyrgyzstan. Homosexuality is permissible for Russians, but certainly not for Kyrgyz. 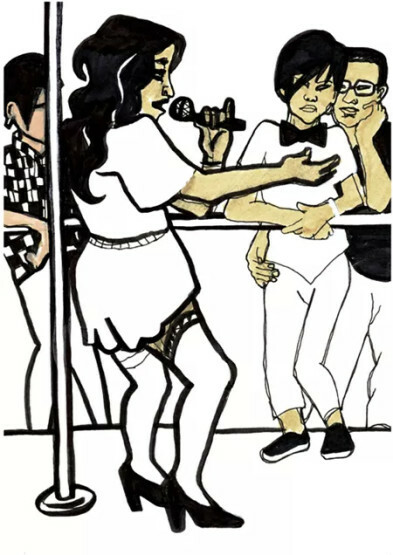 I visited the only LGBT club in Bishkek and, probably, in Kyrgyzstan. Nearly all the patrons were Kyrgyz. 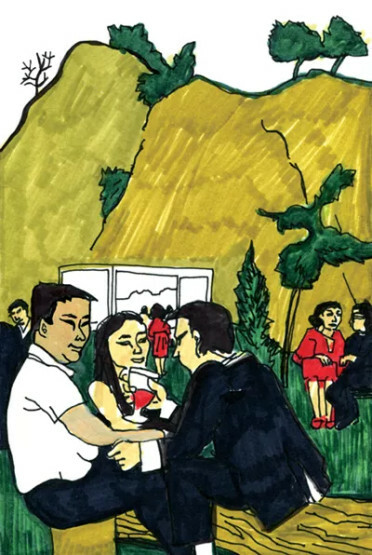 There were only a few female couples: lesbians are even more closeted in Kyrgyzstan than gays. As in Russia, beatings, rapes, and murders of gays, lesbians, and transgenders are widespread in Kyrgyzstan. After passage of the homophobic law in Russia, attacks on LGBT activists have become more frequent. I talked to several patrons at the club, but I won’t write anything about them. Bishkek is a small city, and mentioning any particulars could be dangerous. “We are constantly faced with humiliation and insults. We can’t imagine how to go on living. How do we find a partner? How do we tell our parents? Or how do we make sure our parents don’t find out? How do we leave the club safely? During debates about the law bill proposing criminal liability for “promoting” homosexuality, Kyrgyz MPs claimed they were standing together with Russia to protect the Eastern world against the Western world. Many middlebrows probably appreciate this stance. They don’t follow events in Russia and don’t know that if we allow the state to infringe on the rights of one social group, we are no longer able to stop the flood of laws censoring all areas of our lives. It would be sad if the same future awaits Kyrgyzstan’s nascent civil society.